A national emergency grips the country. Corpses of the recently-dead are returning to life and attacking the living, devouring their victims. In the big cities the situation is acute as people panic and confusion reigns. Two members of a Philadelphia S.W.A.T. unit decide to escape the city. They are Roger and Peter. The two escape with their friends Francine and Stephen in a traffic helicopter taken from a television station where they work. The four manage to land on the roof of a huge out-of-town hypermarket. The building is a temple to consumerism. The shops within the giant structure represent every possible fulfilment of material human desires and needs. The living dead wander through the mall aimlessly, having inherited the temple from the disintegrating human civilisation. Sustained by the last word in supplies and armed with weapons from the sporting goods store, the four survivors manage to secure the shopping mall. They set up living quarters in a Civil Defense storage area, and so are able to live in the building for months... One day a band of hippie types, on motorcycles and in vans, raid the mall to loot the shops. The bandits manage to reopen the secured entrances and the zombies move back into the building. In an extraordinary battle sequence many of the raiders are killed. The fate of the besieged four is in the hands of the band of scavengers and the horde of zombies closing in from all sides. Can they escape? Will it be worth it even if they do...? 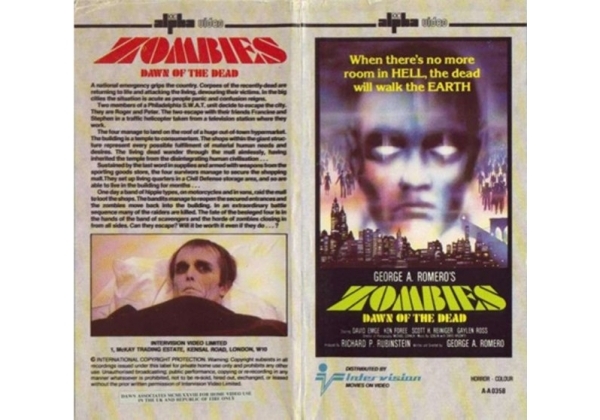 Or find "Zombies Dawn Of The Dead" on VHS and DVD / BluRay at Amazon.